The Igloo® electric cooler uses no ice and can be purchased either as a 26-quart or 28-quart unit. Take it with you for sports events, tailgating, picnics, RVing, in the SUV, car, truck, big rig, and boat. It holds 32 each 12-ounce cans and 28-quarts (26-liter) bottles. Two-quart liters will stand upright. Without using ice, you will have more space for sandwiches and snacks. The Iceless™ cooler uses thermoelectric technology to keep items cold without ice. The inside cools to 36-degrees F. below the ambient air temperature. The cooler is quiet and the motor uses no brushes with convection cooling from the fan circulating cold air. The curved back hugs up against you while you carry it. The comfort gripping handles are a swing-up bale type and the molded-on handles are easy to use for two-handed lifting up or carrying at your side. Do not place anything on the unit so that the air intake and outlet for the fan are blocked. Disconnect the power cord from the cooler before you clean it. Be careful not to get water inside or outside of the fan vents. Before you store the cooler, be sure to wipe it inside and out with a cloth using liquid dish detergent and water. Stuck-on food and stains such as mustard and ketchup can be removed with diluted baking soda and water. Be sure it is rinsed well and dry before storing. Leave the lid open until it is air-dried completely. Plug the UL listed 8-foot power cord into 12-Volt D/C cigarette lighter. An optional 110/120-Volt A/C converter is available as a separate purchase to plug into an outlet. The exterior dimensions are 18.215-inches long x 12.75-inches wide x 17.188-inches tall and weighs 10 pounds empty. 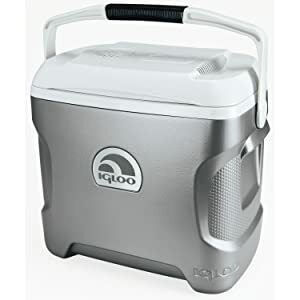 The Igloo® electric cooler comes with instructions, and is warranted to be free from defects in material or workmanship under normal use and service for 1 year from the date of original purchase.